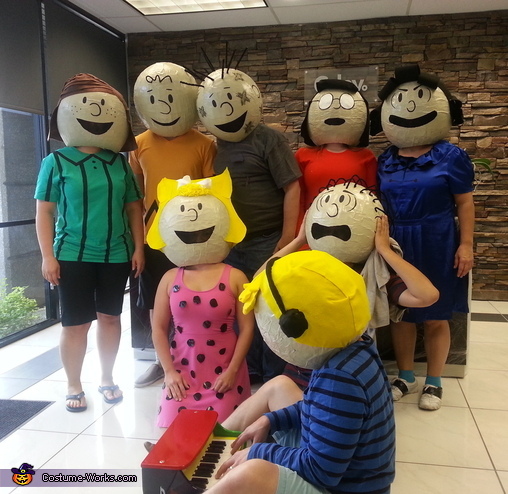 This homemade costume for groups entered our 2015 Halloween Costume Contest. This is our awesome group costume for work! The shape of the heads were built with large punch balloons and paper mache. Once they were dry we cutout a hole for the neck and deflated the balloon. The eyes and nose were painted with acrylic paint. The mouths were cutout and covered with black mesh so we can see where we were walking. The hair consisted of felt or pipe cleaners. It took me about 2 weeks to complete the heads. It was alot of work but definitely worth it.